Scale buildup on humidifier heaters and heat exchangers acts as an insulator, reducing humidifier performance while increasing energy costs. DriSteem's humidifier de-scaling solution, pump kit, and neutralizer work hard to remove these chalky scale deposits and keep humidifiers operating as efficiently as possible. 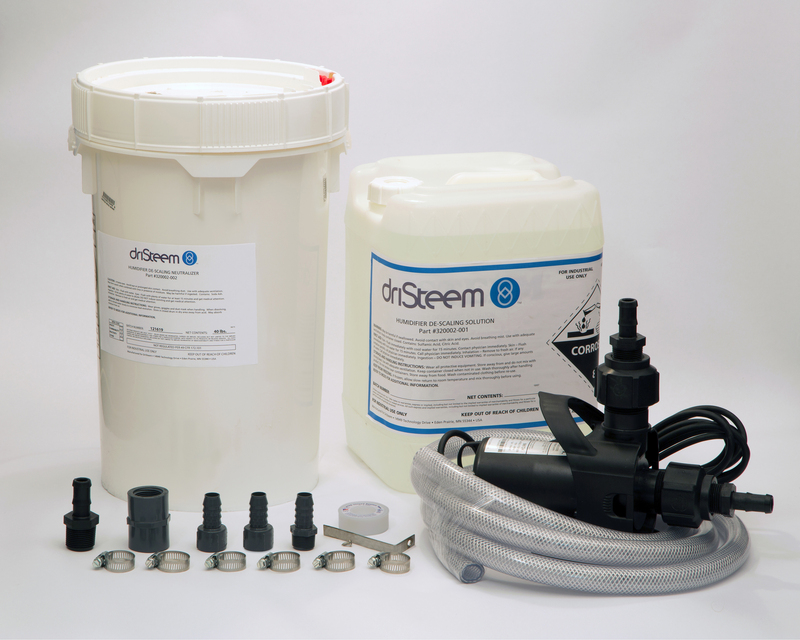 DriSteem's humidifier de-scaling solution removes scale more thoroughly than hand-scraping, and does not corrode the water tank, components, or welds. Add DriSteem's de-scaling neutralizer to the humidifier tank water after following the de-scaling process to bring the water back to normal ph levels. The agitation from this circulating pump greatly increases the effect the de-scaling solution has on mineral deposits in the water tank. Clean humidifiers quicker and more easily by using the de-scaling pump kit along with our de-scaling solution.